The game has been designed and written by industry veterans Gareth Hanrahan, Jason Durall and John Snead. 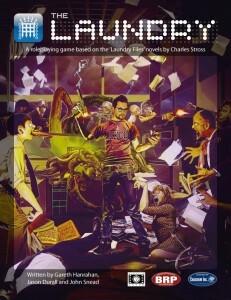 „I’m really excited to be working with Cubicle 7 to bring the sinister world of the Laundry to a wider audience,“ says Charles Stross, Hugo award-winning author of „The Atrocity Archives“ and „The Jennifer Morgue“. Cubicle 7 Entertainment is a British-based publisher and events company, specialising in the games industry. Founded in 2006, by Angus Abranson and Dominic McDowall-Thomas, the company has published role-playing games from a list of licensed and home-grown properties including Victoriana, Starblazer Adventure (based on DC Thomson’s 80’s Starblazer comic series), SLA Industries, Qin: The Warring States and the recent Doctor Who: Adventures in Time and Space (licensed from the BBC). Cubicle 7 also works with a number of publishing partners helping bring their creations to print and into distribution. In June 2009 Cubicle 7 announced it had joined the Rebellion Group. CAPITAL LAUNDRY SERVICES – WHAT NEEDS TO BE CLEANED UP? There are things out there, in the weirder reaches of space-time where reality is an optional extra. Horrible things, usually with tentacles. Al-Hazred glimpsed them, John Dee summoned them, HP Lovecraft wrote about them, and Alan Turing mapped the paths from our universe to theirs. The right calculation can call up entities from other, older universes, or invoke their powers. Invisibility? Easy! Animating the dead? Trivial! Binding lesser demons to your will? Easily doable! Opening up the way for the Great Old Ones to come through and eat our brains? Unfortunately, much too easy. That’s where the Laundry comes in – it’s a branch of the British secret service, tasked to prevent hideous alien gods from wiping out all life on Earth (and more particularly, the UK). You work for the Laundry. The hours are long, the pay is sub-par, the co-workers are… interesting (in the Chinese curse sense of the word), and the bureaucracy is stifling – but you do get to wave basilisk guns and bullet wards around, and to go on challenging and exciting missions to exotic locations like quaint, legend-haunted Wigan, cursed Slough and Wolverhampton where the walls are thin. You may even get to save the world. Just make sure you get a receipt. 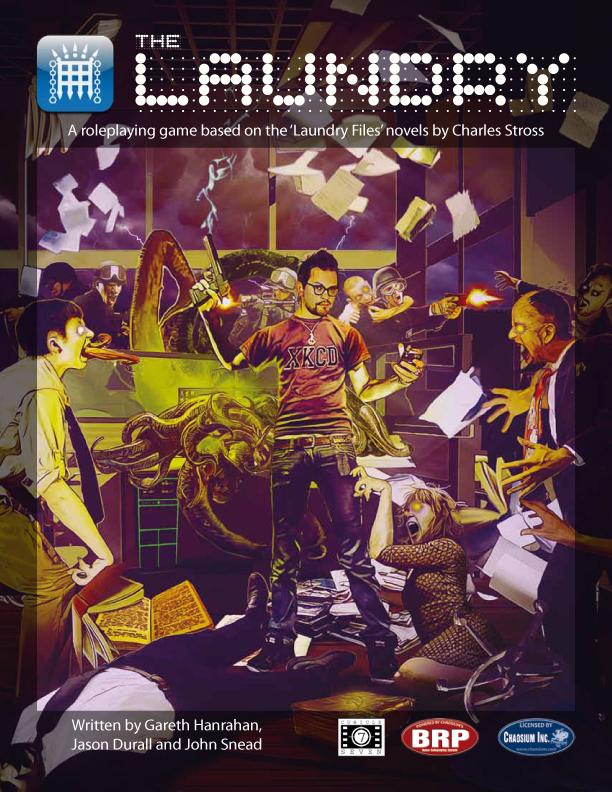 THE LAUNDRY roleplaying game is based on the award-winning Laundry series (THE ATROCITY ARCHIVES, THE JENNIFER MORGUE, THE FULLER MEMORANDUM) by the even-more-award-winning CHARLES STROSS, and uses the also-award-winning BASIC ROLEPLAYING SYSTEM (CALL OF CTHULHU). •	Computational demonology, summoning extradimensional horrors, and three ways to use a shotgun to banish alien monsters.